It was at least 10 years ago that I read in a Scientific American magazine that the future of lighting was the LED (Light Emitting Diode). Being a bit of a geek I have followed its development over the years but up until now have been disappointed. Now it is everywhere. Just in Harare I have seen it in traffic lights, car headlights, brake lights, advertising billboards, replacements for flourescent light tubes, shop lighting, TVs, torches (flashlights to the Americans), security lights on industrial sites and domestic lighting. 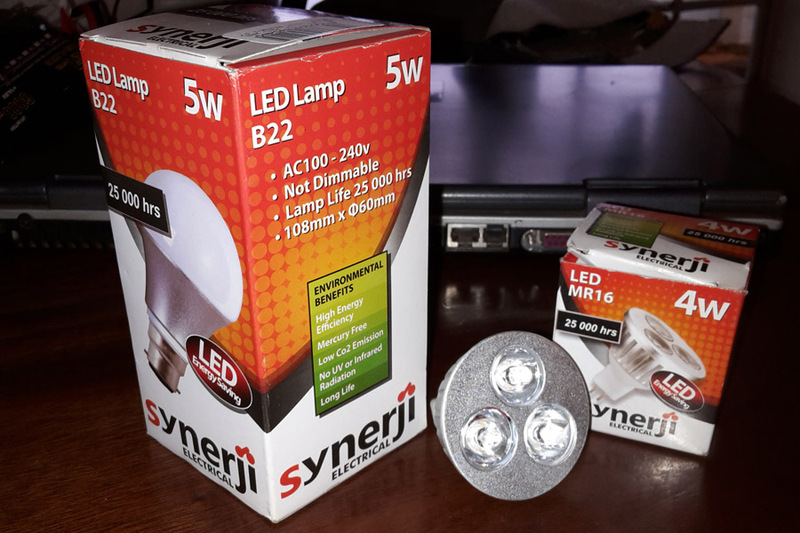 The LED is a hugely efficient converter of electricity into light and according to this article has surpassed the compact fluorescent light in terms of lumens per watt used. The cool white colour problem of LEDs has largely been overcome too. In my local hardware store I spotted this brand of lights. The 5 Watt globe replacement cost $7 and the small spot cost $9 without the mounting. It was also available in a 12 volt version as well as in a flood version. A 12V transformer also needs to be purchased if running off mains though it will also run off a 12 volt battery which makes a solar setup quite attractive (a deep cycle 100Ah battery is over $200 though). Solar panels (photovoltaic cells) are not cheap here at $2/Watt which is well above the break even of 50c/Watt in order to compete with conventional mains. However with the mains supply in this country becoming ever more erratic it does offer a way of at least getting SOME independence from the endless power cuts. For those who can afford it. Old style incandescent globes (or bulbs as they are called here) cost all of 50c which is awfully attractive if you are on the breadline as a lot of Zimbabweans are. Even if the lights pictured really do live up to their 25,000 hr advertised lifetime it would still be awfully difficult to persuade someone unemployed to buy one. For me the day of the LED has arrived but for most people in this country it will have to wait a little longer. HIFA is now over of course. My internet did not work for a full 3 days which is why these posts are late. It took an hour on the phone to a support centre and the good fortune to be chatting to a technician who actually did know what he was talking about to sort it out. It’s still erratic but at least it is working. I thought the programme this year was good. I only saw 2 plays that I thought were sub-standard but that is the nature of arts festivals. I cannot answer the question as to which was my favorite show but I did really enjoy the acoustic guitarists, all of whom were exceptional in their own way. It is of course common knowledge by now that the government blocked the visas of the South African pop group Freshly Ground who were due to play at the closing ceremony on this last day sponsored by Old Mutual, an insurance company. This was apparently over a song that the group released some years back that mocked the president of Zimbabwe (see this link). 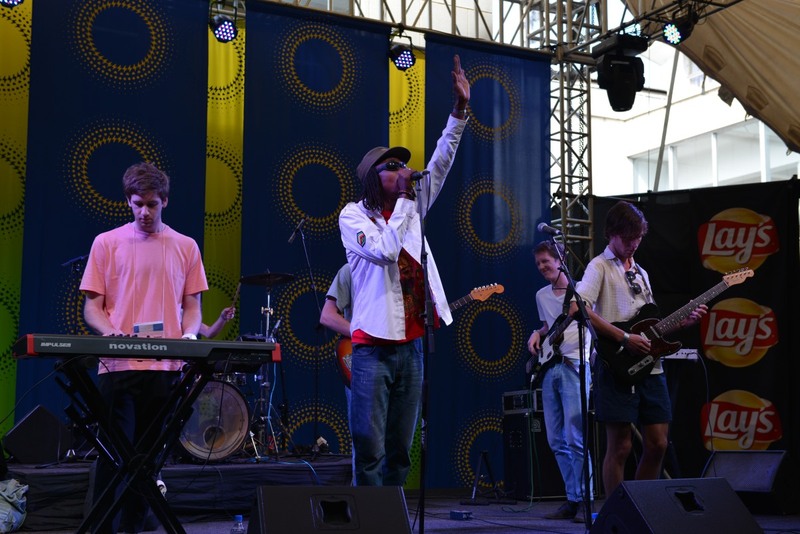 In true HIFA fashion a plan was made, another German group stepped up to the stage along with a host of other international artistes and the show went on! I did not attend the final closing but did get to see a few other things. First on the list was the local National Ballet production – the Breakthrough. A real crowd pleaser with a bit of contemporary ballet and just about every other genre of dance one could think of. It purported to show how all these other styles developed from classical ballet but I wouldn’t vouch for the accuracy of that. The crowd didn’t mind and it was well attended on both days. It was with more than a bit of trepidation that I made my way to the finals of The Trash Queen fashion show but it was not at all what I thought it would be. Participants had to design and make a fashion attire from trash. Any sort of trash would do – air filter, bubble wrap, CDs and loads of other rubbish was used. Participants were individuals and self-help groups, remand centre children and local schools. Fun! Party tablecloths – I think! DVDs and CD fragments. Designed and made by a security guard in his spare time! Video tape. Lots of it crocheted. A dress made from air filters and other things. Material offcuts from a clothing factory. Designed by children at a remand home. Right after the fashion show I moved nearly next door to hear a South African group John Wizards (apparently named after a band member). They seemed pretty chilled. And the music? It sounded like it came from Cape Town. Afro something or other. Not my taste. Then it was time to go home, exercise and feed the dogs and come back to REPS theatre for Bend it Like Beauty with Ben Voss posing as a Zulu woman who succeeds in insulting just about everyone. Very funny but he had to excise rather a lot of political material and as a result I recognized a lot of stuff from a previous show a few years back. Freedom of speech is enshrined in our constitution but does not apply to everybody. I did not take photos – there are only so many photos one can take of a comedian on stage and anyway, I wanted a break! It’s been quite a few years since I’ve been to Mana Pools Game Reserve on the north-western border of Zimbabwe. It is perhaps one of the better known game parks in the country and is very popular “in season” which is usually taken to be June through to the end of September after which it gets too hot for most people. Situated in the Zambezi Valley it can easily get into the mid 40 degrees (Celcius). This time of year it gets into the mid 30s during the day and can be humid to boot and the bush is relatively lush after the rains. There is water everywhere so the game is more widely dispersed than in the dry season when it congregates at the pans and the Zambezi River. But it’s still worth a visit and is far from over-crowded as we discovered this last weekend. Not exactly pretty, there were lots of these crickets around and they ate just about anything; other insects, boiled potato and even each other! These frogs could be found all over the lodge where we stayed. A bit like geckos, they could climb just about anywhere. There was a resident pod of hippos in a pool in front of the lodge. They kept us entertained for hours. The rains had been good, the bush was lush and the impala abounded. This young impala greeted us on arrival. The view from the lodge looking over the hippo pool and a very small part of the Zambezi to Zambia in the background. Looking over the aptly named Long Pool. It was stiff with crocodiles! A ground squirrel on a log. The rest of the gang in the Mucheni campsite; Sybille, June, Sheldon and Gary. On the road. Open plains such as this are not the norm in Mana Pools. Gary fishing on the small section of the Zambezi that flows past the lodge. Who cares if you don’t catch when you can look at a view like this? If the cosmos is out summer is coming to and end. It’s been a strange summer; very patchy rainfall though the overall quantity was about normal. The south of the country had significant flooding at the beginning of February but it’s all very dry now just when the maize and soya crops need moisture to fill the cobs and pods. So I guess we will be begging for food from the WFP and others. Well, the cosmos is pretty enough. 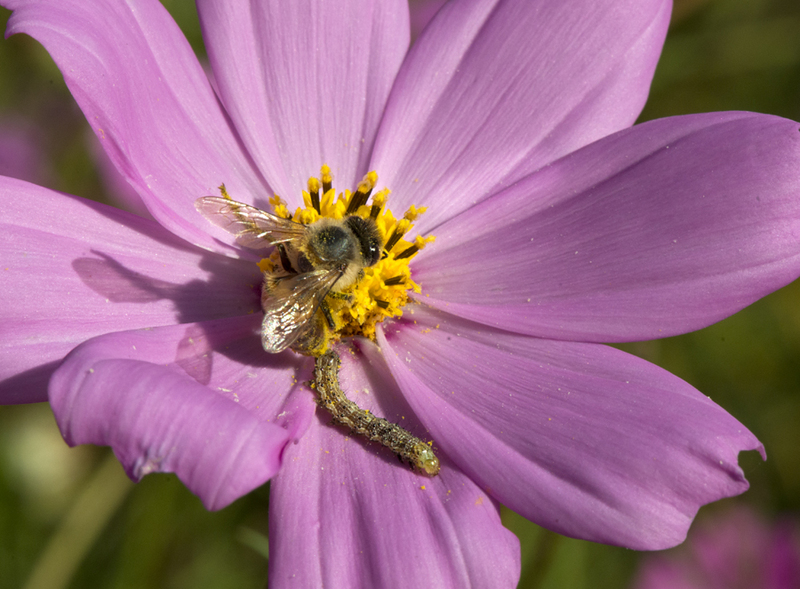 I caught this bee and caterpillar sharing a flower. This is not the first time I have seen bees attracted to diet Coke (and its variants). It poses an interesting question; do bees find the same substances sweet that we do? Obviously sucrose is attractive to them and one just has to leave the honey jar open to find out that if there’s a short cut to collecting honey they will take it. But synthetic sweeteners? Do they have the same taste receptors that we do? Or maybe they are smelling the sweetener in this Coke Zero. No it was not the moisture on the outside as I watched this bee go inside the can. 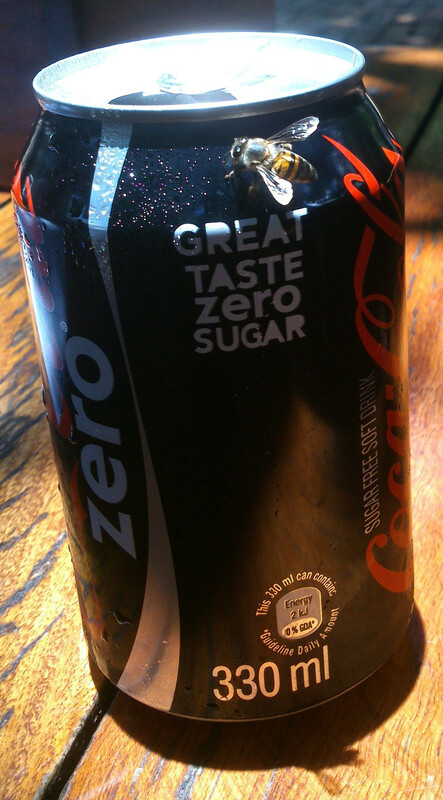 I have no idea whether it actually drank the Coke, anyway, the can was empty. Oh, and I’m open to negotiation should Coca-Cola decide to use this photo for advertising purposes. Entertainment in Harare can be a bit lean – the West End we are not. So people get creative. Drinking is a popular pastime with the sports clubs and various bars, especially on a Friday night. Most middle-income families have satellite TV with all the usual channels that one could find in Europe or the UK. I have found the satellite TV with its endless repeats and bad films tedious so opt to get my entertainment from the internet and in the form of DVDs from Amazon UK. They take 10 days or less from the UK and if I’m lucky, which mostly I am, I don’t get charged duty provided I keep the orders small. The internet is not bad in Harare. As I live just out-of-town I don’t have access to the genuine broadband from the newly laid fibre optic cables that have been going in for the last year or so. I rely on WiMax which is generally OK though occasionally it just loses the connection. I could get the ISP techs to come out and redirect the aerial but that would mean killing the bees in the chimney onto which the WiMax aerial is attached, so I just put up with it. I collected a number of DVDs from the post office yesterday and, last night, being thoroughly unmotivated, sat down to watch the latest Star Trek film. I should explain I am not a “Trekkie” but I have seen one of two a few years ago so thought it would be quite fun to see how things have changed. Well, I have seen the future according to Star Trek and it is good. Some 200 years in the future we will still have a role in flying complex spacecraft which still have engine throttles à la current airliners. The aforesaid spacecraft will have beam weapons that still miss and humans will still fly them through impossibly small gaps that a computer just could not manage despite being able to beam crew members up to distant locations. Pretty girls will still be wearing impossibly short skirts (a pity I won’t be around for that) and medical staff will be wearing starched white safari suits. The baddies will still be speaking with a plummy English accent and over-acting the part and the goodies will be led by an arrogant American who learns humility through self-sacrifice. Quite familiar and not at all bad. The future that is, I definitely won’t be buying another Star Trek DVD. It seems the Minister of Finance in Zimbabwe is struggling to see or imagine what the economy might be doing next year. He has postponed presenting a budget this year and has said it will come out early in the New Year. My guess is that he simply hasn’t got a solution for the lack of money in the economy. Employment is still falling and I know of at least two people made redundant from companies that have closed in the last 6 months. My company had an excellent September and dismal October. It’s not often that the deposit summary that I print out for the bookkeeper only runs to one page. In fact, I think this is the first time it has ever happened. The future I am seeing here is not great. It is not all doom and gloom of course. 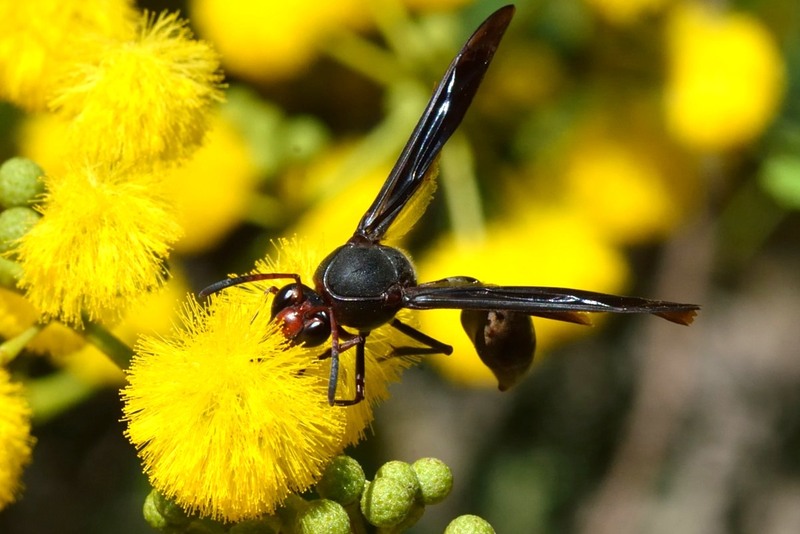 The Acacia karoo outside my bedroom (that I planted 9 or so years ago) has been in splendid bloom and alive with insects, all living for the present. I caught this wasp, plundering nectar. Its future is now and I bet it doesn’t give a hoot for tomorrow. It is not often I get a view like this at the beginning of October. Just 2 days prior to this there was so much smoke in the atmosphere that the sun effectively set at 5 p.m. – a good hour before it would have dipped below the horizon if one was visible. The day before THAT the thermometer hit a record 35 degrees C – the hottest September day on record. By this morning it had plunged to 14 degrees, definitely cold for October. So yes, it is great to be cool and clear. But there is a catch. 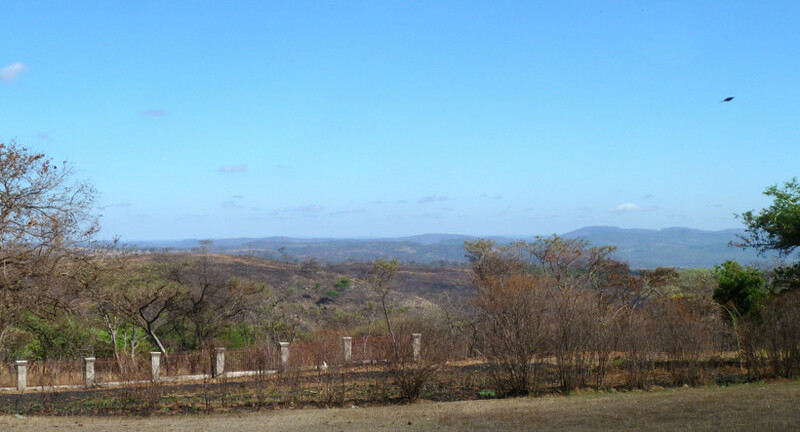 As far as the eye can see (about 60km in this case) the bush has been burnt. It will continue to burn until the rains arrive, hopefully in mid-November. What this costs the country , and indeed the sub-continent, in lost soil fertility can only be guessed at. If the world has to increase its food production for a burgeoning population we could well do our bit by controlling the bush burning – after all, Africa will be where most of the population growth will occur. And that black shape in the sky top right, that’s a bit of good news. It’s a bird. Take a photo in this part of the world of the sky and there is invariably a bird in it. But will this abundance always be there if the environmental degradation continues apace?